Take a lovely cruise up the Trent & Mersey Canal, a canal built to end the pottery breakages! Cruise past the potteries and through the 1.66 miles long Harecastle Tunnel where according to legend a young woman was decapitated in the Telford Tunnel in the 1800s and her body thrown into Gilbert's Hole, a coal landing stage within the tunnel. The man had hacked the woman's head from her shoulders with a piece of slate until it was removed. It is believed that she now haunts Harecastle Tunnel, either in the form of a headless woman, or a white horse, and her appearance used to forewarn of disaster in the local mines. As you are on the outskirts of Stone, you may like to stay moored up and visit the town before leaving. Stone is a busy, pleasant town, with excellent shopping facilities. At the canalside there are dry docks, wharves and old brewery buildings, as well as the old priory church which in 1751 was rebuilt by the parishioners. There are also plenty of pubs and restaurants to choose from if you want a meal before setting off, for example: The Star (canalside); The Three Crowns; The Crown Hotel. Leaving Stone, you continue through the last locks of the Stone flight, look out for the little tunnel under the road for boat horses by lock 29. You will be cruising up the valley to Meaford, via a series of locks and bridges, and for a time, the railway runs adjacent to the canal. Soon you will approach Barlaston, a small, sprawling village, moor by the Plume of Feathers a canalside pub, as it it 2 hours to here and a good place to moor for the night. The pub has a good selection of real ales and good food. Within a short distance you will come to Bridge 104 where there are some good moorings which enable you to visit the Wedgwood Pottery, set back from the canal. The World of Wedgwood, a unique, interactive visitor centre experience celebrating the very best of British craftsmanship. Experience Wedgwood for the day through shopping, food, visitor tours and art and craft workshops. You can get a factory tour and the Museum is well worth seeing, also the factory shop. Also from here, you can reach Newstead Wood and Hem Heath Nature Reserves, both large open spaces, and a brief reprieve before you reach Stoke on Trent. Leaving Wedgwood you negotiate Trentham Lock, and if it's nearing lunchtime, in Trentham Village there is a Toby Carvery. Trentham Gardens can be found a short walk to the west from Bridge 106 on the southern fringes of Stoke. The nearer you get to Stoke on Trent, the busier the canal becomes, with rebuilding of old factories and evidence of the city's pottery industry all around. The canal cuts directly through the middle of this sprawling conurbation set in amongst hilly valleys and areas of reclaimed industry and the beginnings of large scale redevelopment. There are large brownfield sites throughout Stoke but also large areas of parkland to be seen from the canal. There is a wide choice of shops to re-stock provisions on the journey through Stoke, as well as The Potteries Shopping Centre for all non-food shopping needs. Among good places to visit whilst you are in Stoke on Trent are the Etruria Industrial Museum, The home of Jesse Shirley’s 1857 Bone and Flint Mill, the only remaining operational Steam Driven Potters' Mill in the world, opening times are limited so see website for details.It is situated between the Trent and Mersey Canal and the staircase locks flight of the Caldon Canal. Just a short walk from here is Festival park, Stoke on Trents largest retail park, also home to Waterworld if you fancy a jacuzzi or the kids wnat to get rid of some energy on the long waterslides! There is also a cinema on site, and many restaurants and food outlets. Cruising on, once you reach the Stoke flight of locks, keep to the left, as here the canal branches off to the right (the Caldon Canal). It is only a short cruise to Harecastle Tunnel, one of the longest tunnels in the UK, at 2,926 yards (1.66 miles). It takes around 30 – 40 minutes to cruise through the tunnel. You need to find out the opening times. Legend has it that in the 1800's a young woman was decapitated in the Tunnel and her body thrown into a coal landing stage inside the Tunnel, called Gilbert's Hole. So look out for her ghost in the form of a white horse, or a headless woman. . . Some tunnel keepers will also tell you tales of a number of boats that went in, but maybe one less came out! 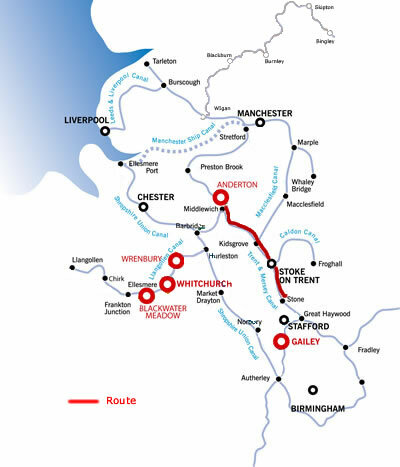 Once through the tunnel, you will soon reach Harding's Wood Junction, where the Trent and Mersey joins the Macclesfield Canal, which crosses the Trent and Mersey on Poole Aqueduct. Canalside at Harding's Wood Junction, is a pub called The Blue Bell, where you might like to take a leisurely drink and early meal. At the Kidsgrove junction, bear left on the Trent and Mersey, where there are now many locks, which are sometimes called 'heartbreak hill', but are know to locals just as the Cheshire Locks. Most of the locks are narrow pairs, having their chambers side by side. Moor at the moorings at Church Lawton it is 8.75 hours to here. The canal now meanders through small villages, whilst slowly rising through the countryside via the locks. At Hassall Green, there is a canal centre, called Lockside 57, which is located at the old buildings by the paired locks No. 57. Here, there is a family restaurant, with lockside seating and reasonably priced food, from breakfast to dinner. You will pass under the M6 Motorway Bridge and make your way towards the Wheelock flight of locks, descending into the quiet and unspoilt countryside, and passing Sandbach to your right along the way. The village of Wheelock has a busy main road running through it. There are local stores here and a selection of pubs, including Nags Head and The Cheshire Cheese. Cruise on through an increasingly flat and industrial landscape, and past a number of salt works, towards Middlewich, a long-established salt producing area. The canal wends its way around the outskirts of Middlewich, through locks and passing moored narrowboats. Again, there are many pubs here – The Kings Lock Inn, The Cheshire Cheese, The Newton Brewery, Boars Head Hotel and The Big Lock. Moving on from Middlewich, you will be in pretty countryside again, the canal being overhung by trees as it meanders along the hill side, following the valley of the River Dane. Moorings along the route are bedecked with picnic tables and barbeque facilities, supplied by Broken Cross Boating Club. You will be heading to Northwich, which is at the junction of the Rivers Dane and Weaver. Northwich is another salt mining town, typical of this area. The town centre is close to the wharves near Town Bridge, and there are good moorings here. There is a relatively new shopping precinct in the town and a variety of pubs and restaurants. 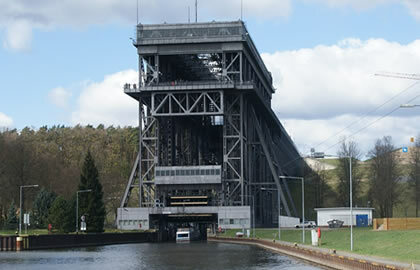 Leaving here, you will soon see Anderton come into view, with its iconic boat lift. For lots of interesting information about the boat lift, visit www.andertonboatlift.co.uk or call 01606 786777. There is a cafe at the lift, serving hot and cold drinks and light snacks. Its opening times are the same as the lift.